many beautiful and special fabrics. I also used Tyvek- first painting it in brown tones, -then sewing it on top of the collage, and after that burning it away again. you can see it in those two photoes , it looks very special, and 3 dimentional! I want to give credit to Audrey Hernandez,smallcreations.blogspot.com,- whom showed this tecnique in a Somerset Studio. This photo I did some weeks ago , when my husbond and I made a walk to a nearby mini town,---Arriving to Melsted, all the trees near the sea, was fillled with magpies- ---this is how it looked -not this one tree,only---but in maybe 10 other trees also- Fantastic! How is your sunday ,dear friends ? I hope you enjoy it, and hope you are warm and cosy, wherever you read this . I think it is amazing ,and really difficult to understand, that many of you ,from all over the world will in a few minutes ,maybe click into my blog to read this. I feel so blessed to be a member of this beautiful club of ours- and thankyou all of you visiting, and everyone commenting, it means so much to me. I feel blessed , having found dear friends from afar! I want to show you more beautiful gifts recieved from friends in blogland! She looks to me as if she is off to an English Horce race.......... Dearest Lynne, thankyou so much- ,you are such a lovely friend,and I am- as you know- in love with your beautiful creations, and happy we have met. And this wonderful piece of babric was inside as a gift to me ,together with the sweetest handsewn and quilted star . This beautiful angel card - also sewn enterily in hand. I so love it dear Jillayne,with the beautiful paper background and the bow with a shiny golden heart. A close up ,of the bow with the tiny heart, isen`t it the cutest ?- I think it so beautifully shows and symbolises the love and friendships built between bloggers, from all over the world. And I am so thankful to have found a dear friend in Jillayne. Thankyou dear, for this so beautiful gift, from you and your clever hands. Today we at last have a sunny day, it has been raining and raining for dayes, -one good thing about that, is that it took the snow almost ,away. Welcome to all the new followers, I am so happy to see you, and will try to visit all of you. Lots of hugs and love to you all. The napkin in french and the most lovely heart , so sweet. Inside I first found the wonderful little bag-see the heart with the french Pour vous- made on paper background. Isen`T it the most beautiful hiding spot for ATC`s or cards - I so love it, Marie. and looking inside was one of Marie`s beautiful note books- See the tiniet nest with the pearly eggs, and the blue bird she used,-- pure beauty. Also this dear sweet friend spoiled me with a peg rolled with wonderful cotton lace, and the most lovely card. I hope to get it one day Marie. You made me so happy with this special and beautiful packet, thankyou from my heart dearest friend. I have also recieved a beautiful packet from another of my dear blogging friends, JILLAYNE- A Fine Seam ,which I will show you next time. I also want to thank all new followers, you are all so treasured. Hugs and love to everyone out there. It all means so very much to me. This heart I made to Lena, my dear friend here on the island, --when we last week were invited for dinner. From March first , Google Friends Connect is no more supporting the NON Google community-that means that everyone not having a blogspot .com blog will not be able to follow via Google connect- --also maybe it will later disappear from Blogger.com ---which means there will also not be any blog list! SO IF YOU STILL WANT TO BE ABLE TO FOLLOW ME AND EACH OTHER ,all you have to do is connect to the new followers tool, -that you see on my left sidebar, just on top of the Google one. Just sign in and create your own account- it is all free- you simple click "follow me" at the new "LINKY "tool--and after having created an account yourself, you can follow me and everyone else connecting to LINKY. And now to the Valentine swap, which Kimberly from Art Joy Stuff hosted, and sweetly invited me to take part in. 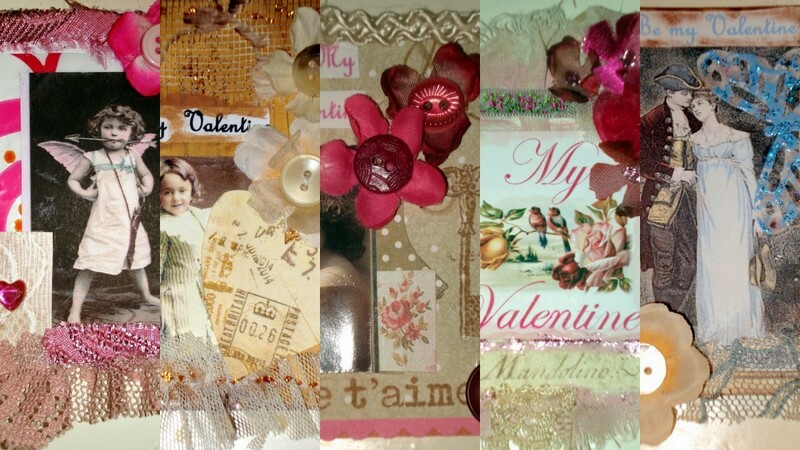 We were to make 5 ATC`s to send to her, and then she would mix and match-and return 5 others to each participant. This is a collage of the five I made and send along. Here is another sweet plastic bag holding another one, and following are the ones I recieved. Marlene from Uniquelyella made this beauty- my photo does not show all the lovely glitter. and from Kimberly this lovely fairy tag--love the flowers and her arrow ,and a wonderful domino charm. Thankyou to you all, I enjoyed partisipating in this "love" swap- and I love all the pretty ATC`s I recieved. Thankyou Kimberly for hosting and for your lovely extra charm gift. I love beautiful old images of birds, and this in black and white is a favorite-and as many of you know, I also love nature images, so this combination alwayes is beautiful ,I think. Can you see the button in the right side, they are made by ABBY, from Abby`s Paperie Garden--click the photo to see it closer. Sweet Abby sells thise beautiful paper buttons in her Etsy shop. One of my very dear blog-and telephone friends here in Denmark--dear Anni- desited that it was time for us to meet, and that it was most practically done, in Copenhagen-where both she and I have our daughters.So after I left Mathilde with her parents, we met ,and had a very happy, and wonderful time together, for the most of the day,till my buss to Sweden and home ,arrived. It was first time we were face to face, so we had joked about what would happen,if suddenly we could not talk at all! This photo of us,was taken by Anni`s sweet daughter ,whom came to meet her, when we said goodby--can you tell it was cold! and exchanged our christmas gifts. I love all the handmade laces and doilies , and the beautiful images Anni used. It fits wonderfully at the top of my coutch- and the colours Anni choosed are perfect for this spot. Thankyou so much dear friend- I love your gift-and I love you-thankyou for the most beautiful day. The sea is very cold here ,too-and as you can see there are ice on all the rocks- they promised a bit warmer weather for the week-end-- lets hope they are right. Hi all dear friends, --we are allone here again,and I thought I would show you a collage I made some weeks ago,-and also a fantastic surprice I recieved with the post. as you can see I used lots of old laces and a beautiful angel image. I covered it with a piece of mica, sewing it on with the mashine. I also used old papers, tea bag,- and my loved skeleton leaves, in the button right corner. It came from dear SONYA, of COUNTING MY BLESSINGS---totally out of the blue, as a bloglove gift.And I am so in love with both creations, and feel so blessed recieving such gorgeous art pieces, just like that! Inside the wonderful paperbag, was this stunning card, which my photo does not do justice- as it is a totally beautiful shimmer of the glitter Sonya used, and you can`t see that the angel is standing out from the background, and all the lovely flowers. 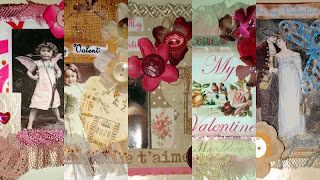 Inside the packet was this -I did not believe my eyes- beautiful collaged piece- in the most pretty romantic colours, the rose that Sonya made herself, and the sweet little charms. I so love it, and also that it hangs from a dryed branch. If you click the photo you can read the text, that have a special meaning for dear Sonya, that I`m now sharing. Isen`t it the most fabolous piece,-I think it is! Thankyou dearest Sonya from my heart, you made me feel so happy and blessed sweet friend. I`m sure many,many of you know Sonya, but if not- go visit her lovely blog-just click her name above. have lots of wonderful things for sale in her shop ,and this french tags I had to have. I love this Marie Antoinette picture , and the lovliest laces ,Liz used . Dearest Liz, I love it all, and your tag is hanging here in my room,--thankyou so much sweet friend. If you click this last photo you can read the adress of Liz`s wonderful Etsy shop---go take a look ,---there are new goodies for sale very often. Here winter has arrived-- not so much with snow, but it is so very cold, and therefore wonderful to stay inside creating, which I will do the coming months .